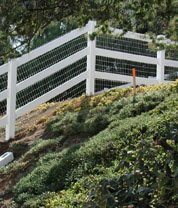 J&J Vinyl Fencing is Compton's preferred vinyl and aluminum fencing provider. We offer our vinyl and aluminum fencing to all of Los Angeles County, and back our fence installations with a lifetime warranty. 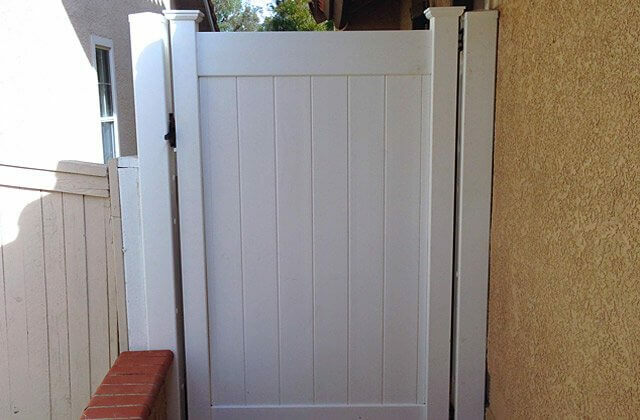 Our company was established in 1978, and since that time, we have provided our exceptional quality fencing and gates to countless numbers of satisfied residential and commercial clients. We are known throughout our service area for our commitment to providing high quality craftsmanship and competitive pricing, as well as our dedication to providing excellent, personalized customer service. 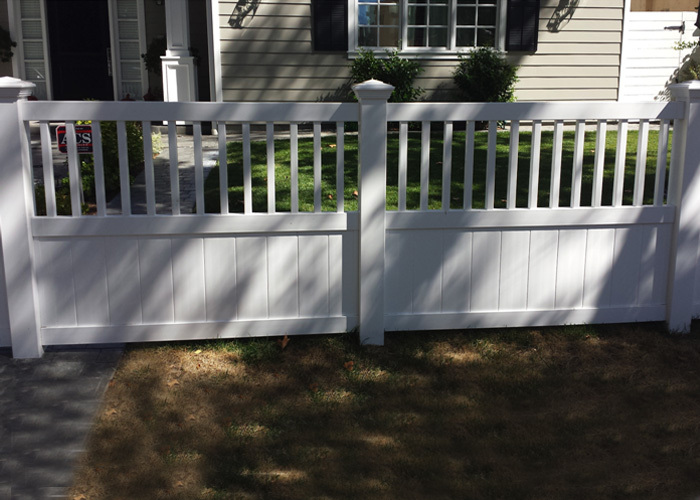 Vinyl Fencing is the durable alternative to traditional wood fences and gates. It has the appearance of wood fencing, but typically lasts for decades longer. It resists damage caused by sun, wind, rain, and insects, and will never splinter, flake, crack, or rot. It is virtually maintenance free, and never requires painting, staining, or sealing. 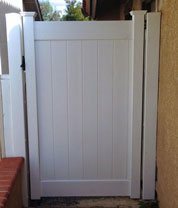 Vinyl fences and gates are available in a wide array of traditional and contemporary designs which will complement the look and add to the assessed value of your Compton home or business property, including privacy, semi-privacy, ranch rail, and picket designs. In addition, they are available in a choice of colors and fence heights, and in both smooth and wood grain finishes. Similarly, aluminum fencing also serves as a more durable fencing alternative to wrought iron: It is far longer lasting than wrought iron fencing, but has the same traditional, Old World appeal. Aluminum is not a ferrous metal like iron, and is not susceptible to rust and corrosion. For this reason, it is a much longer lasting fence material than iron, and is very low maintenance. Aluminum fences and gates are available in many of the same styles and colors as traditional wrought iron fencing, and will provide your Compton home or business property with a very attractive, secure, and lightweight fencing system. Contact J&J Vinyl Fencing, for Compton's best value in premium quality vinyl and aluminum fencing. We are a licensed, bonded, and insured fencing contractor, and accept Visa, Mastercard, Discover Card, American Express, and checks. Our hours of operation are Monday through Friday, from 9:00 am to 5:00 pm, and also Saturdays and Sundays by appointment. J&J Vinyl Fencing is Compton's trusted choice for premium quality vinyl fencing and gates. Vinyl Fencing is both affordable and extremely durable, and has the appearance of wood fencing without the maintenance concerns. 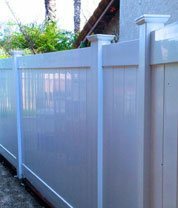 We offer our vinyl fencing in a choice of privacy and semi-privacy designs, vinyl colors, and smooth and wood grain textures. In addition, each of our installation projects is personally supervised by our company's owner, to ensure excellence of workmanship and complete customer satisfaction. Contact us today for a free estimate in Compton. Aluminum Fencing and gates have the look and design appeal of traditional wrought iron fencing and gates, yet are virtually maintenance free and extremely durable. In contrast, traditional wrought iron fencing must be carefully maintained on a regular basis to prevent the development of rust and corrosion, because even the smallest scratch or other damage to the paint or powder coat finish protecting the iron can leave this fencing vulnerable to the elements, against which iron has little defense. Conversely, aluminum fencing possesses a natural chemical resistance to water and oxygen, and typically lasts for decades without rust or corrosion problems. In addition, it is also lightweight and easy to repair, and can be powder coat finished in a choice of beautiful colors. At J&J Vinyl Fencing, we install some of the finest privacy fencing in the industry. Our privacy fences feature a click-and-lock assembly, and have no gaps in between the fence boards. They are available in a choice of heights, colors, and top details, such as a lattice insert or scalloped picket top designs, and also come with a choice of post cap options, including ball, cape may, coachman, federation, contemporary, gothic, New England, and pyramid. Our privacy fencing has the appearance of wood fencing with none of the maintenance requirements, and never needs painting, staining, or sealing. 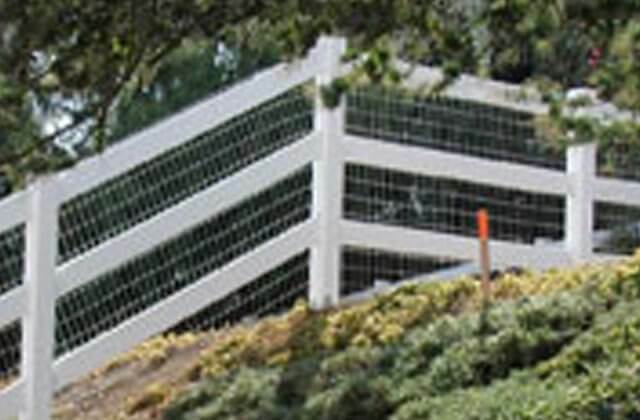 In addition, in contrast to wood fencing, it will not crack, splinter, warp, or rot when exposed to the elements, and because of its SolarGuard™ protection, will not fade over time as a result of sun exposure. Semi-privacy vinyl fencing is the perfect way to delineate your Compton home or business's property line, while at the same time providing an attractive hardscape accent. It is also ideal for enclosing pools and for constructing animal enclosures, because it provides a strong and secure barrier which does not obstruct the view of the pool, or your pet or livestock. 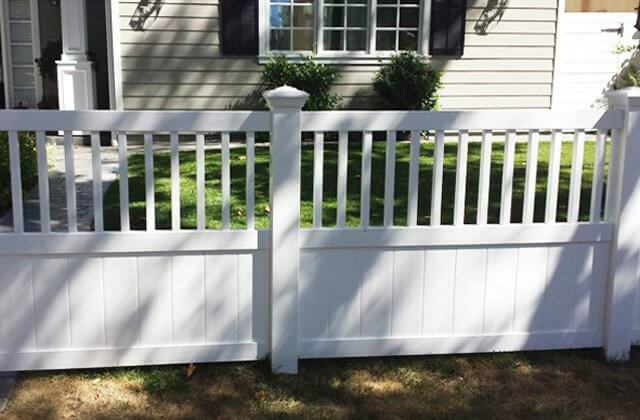 It is available in a variety of designs, using a combination of fence post, fence board, lattice panel, fence rail, and fence picket configurations. In addition, it is also available in a choice of colors, including a natural cedar-look vinyl. Our ranch rail fencing comes in a choice of one rail, two rail, three rail, four rail, and crossrail designs, and is both durable and affordable. It is useful for many applications, and offers both distinctive style and unmatched structural integrity. Whether you would like to fence horses or other livestock, or simply want the traditional appeal of ranch rail fencing for ornamental purposes, J&J Vinyl Fencing has the right vinyl fencing for your needs at a competitive price. Call us today. 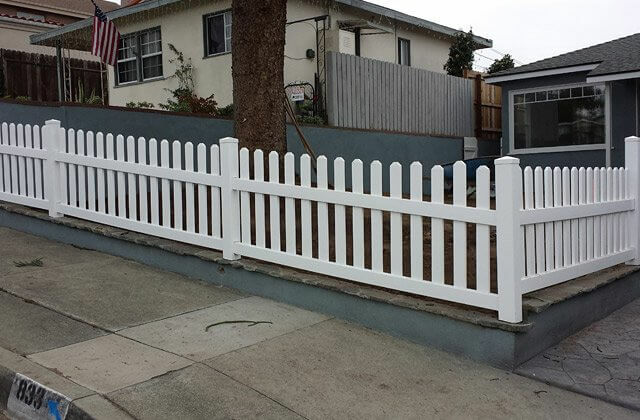 Picket fences have a traditional appeal which is hard to match, and at J&J Vinyl Fencing, we offer our picket fences to Compton in a wide selection of styles, and a choice of vinyl colors. We offer traditional style picket fences with scalloped, stepped, staggered, and arched top designs, as well as contemporary style picket fences with top rails for a more modern look. Contact us today to schedule a free design consultation and estimate. At J&J Vinyl Fencing, we can automate any of our vinyl or aluminum gates with a state of the art access control system. We install top brand name automation systems such as Elite, DoorKing, and Viking, and can design these systems to be operated by your smart device, a keypad, or a remote transmitter. Access control is a great safety feature, and can significantly enhance the level of security protection at your Compton home or business. Contact J&J Vinyl Fencing today to schedule a free estimate on an automated vinyl or aluminum entry or driveway access gate system. J&J Vinyl Fencing is licensed, bonded, and insured. 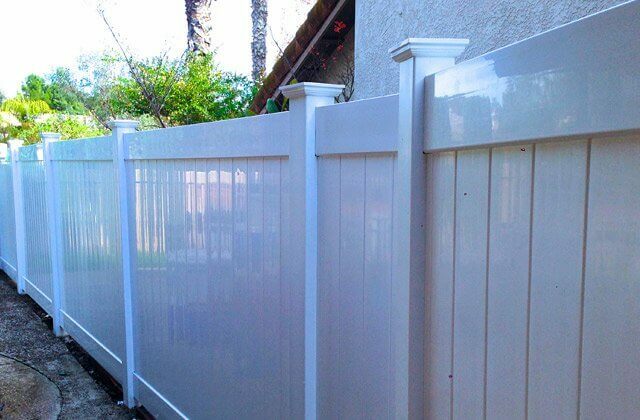 J&J Vinyl Fencing has been serving Compton for decades, providing both home and business owners with premium quality vinyl and aluminum fences and gates at affordable prices. Our skilled fencing craftsmen take great pride in their work, and each of our projects is overseen by our company's owner. We accept all major credit cards and checks, and offer our first-time customers a 10% discount on their vinyl or aluminum fencing installation. J&J Vinyl Fencing is licensed, bonded, and insured. 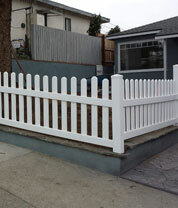 We recently installed this semi-private residential, front yard white vinyl fence in Los Angeles, CA. 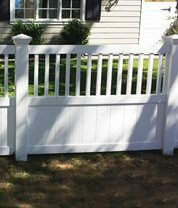 This vinyl fence can be customized to a height between 4 feet and 8 feet.